Embrace your beauty and look absolutely classy by wearing this pink and gold colored necklace set from our latest collections. 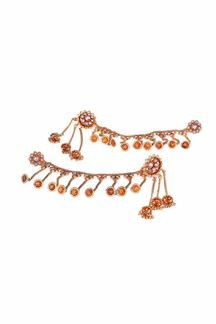 This semi precious stones embellished necklace set is perfect to be paired with sarees and lehenga choli. Enhanced with 22kt gold finish, this necklace set is light in weight and a quality pick. Note: Please note that the Free Shipping offer doesn't apply to any products purchased under the Accessories Section. Shipping charges will apply. Shipping charges will be waived off only if the product is bought along with any product under the following categories - Sarees/Lehengas/Suits/Kurtis/Gowns.